It’s all about first impressions. You have a chance to talk to business leaders from your favorite industry – only that you’ve just got 3 minutes with each of them. How do you use the short time to present yourself, seek advice, and even make a personal and professional connection? It’s like speed dating, but with senior executives. On Tuesday, June 18, MCO’s summer interns joined AmCham YPC’s Senior Executive Speed Connection and Networking Event in the Kerry Center Hotel. Senior executives and leaders attending the event came from a variety of industries, including aviation, energy, public relations, healthcare and medical devices, sports management, think tanks, non-profits, government relations, beverages, executive troubleshooting, financial management consulting and others. The speed networking portion of the evening consisted of an executive networking round-robin, in which young professionals had 3 minute timed conversations one-on-one with each senior executive. Over the course of one hour, the interns talked to the top members of companies and organizations in Beijing, and obtained insider’s advice about entering into the business world in China. This hour-long session concluded with AmCham’s monthly member cocktail at Centro Bar, located on the ground floor of Kerry Center Hotel. 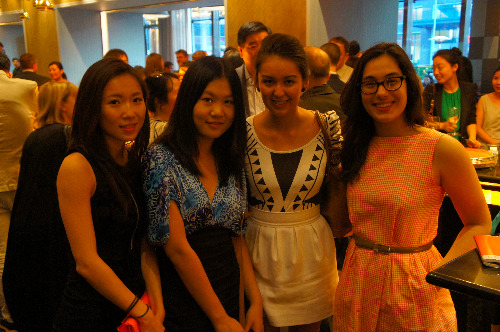 Interns continued conversations with the executive mentors, and mingled with other AmCham members.